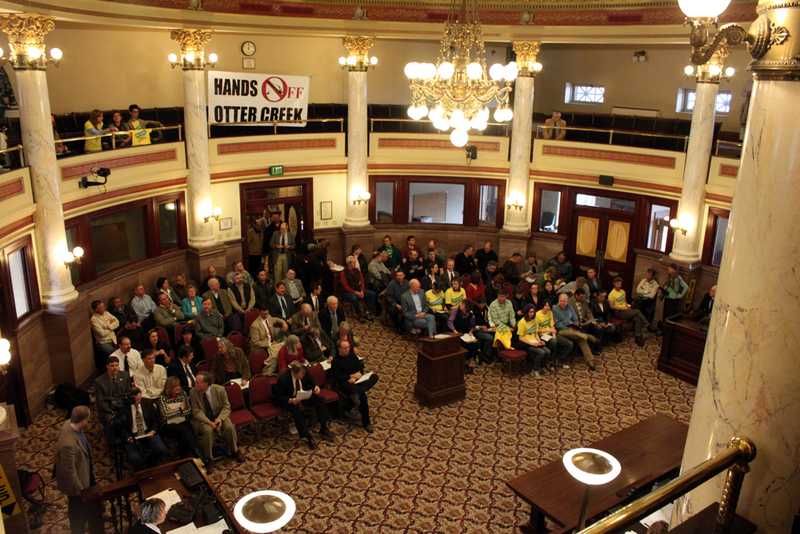 On Tuesday, February 16, the Montana State Land Board once again made a mockery of the “democratic process,” ignoring the solid and heartfelt arguments of the public as it moved to give Otter Creek away for a pittance, caving under pressure from mega-corporation Arch Coal. At the previous meeting of the Board, a bonus bid of 25 cents per ton was set as a supposed minimum sale price to avoid subsidizing controversial aspects of the Otter Creek mining proposal, such as the Tongue River Railroad. However, a majority of the board members are apparently so desperate to destroy the pristine alluvial Otter Creek valley in southeastern Montana that when no companies accepted the already undervalued price by the February 9 bidding deadline, they voted 3-2 to lower the asking price and try again. Environmentalists, Northern Cheyenne tribal members, educators, students, ranchers, business people, and Northern Rockies Rising Tide attended the meeting to tell the land board to stop the proposed ecocide at Otter Creek. Gov. Brian Schweitzer received particular attention from the public commenters as he was confronted about his corrupt business affairs such as the $100,000 campaign contribution he reportedly received from Arch Coal Co., the primary corporate interest in Otter Creek. The only response the land board received by the February 9 bidding deadline was a letter from Ark Land Co., an Arch Coal subsidiary, asking for the price to be lowered. Arch Coal already holds the lease on adjoining coal tracts owned by Houston-based Great Northern Properties. As the state and private lands are positioned in checkerboard fashion, it is widely accepted that the coal could not be feasibly mined by Arch without access to both the Great Northern and Montana School Trust Lands at Otter Creek. As opponents to mining at Otter Creek faced an increased number of comments by mining proponents, primarily paid union officials pontificating to the all-democrat Land Board about job creation, the meeting took on a more contentious tone than previous ones. Testimony included more direct verbal attacks on the land board members themselves, particularly the Governor. One protester breifly shouted down Gov. Schweitzer about ten minutes into the his twenty minute speech justifying the leasing of Otter Creek (a speech so full of strange non sequiters, including a very bizarre metaphor comparing democracy to a grapefruit, that many of the Governor’s listeners walked away more confused than convinced). As Schweitzer was rambling on about coal bid prices and other purposely convoluted economic rhetoric, the person in the “peanut gallery” yelled out “Your three minutes are up, Governor!” referring to the three minute time-limit set on public comments. Only Denise Juneau, Superintendent of Public Instruction, and Steve Bullock, Montana Attorney General, voted against lowering the bid price. Later in the afternoon on February 16, students from Hellgate High School in Missoula marched with chants and picket signs from their school, across the Higgins Street Bridge on the Clark Fork River, to the Missoula County courthouse in protest of the Land Board’s plans to give away Otter Creek to be mined. This is the second protest by high school students in as many weeks about Otter Creek. One week prior, on February 9, students from nearby Big Sky High School left class early in a similar protest. See our VIDEOS page for full testimonials from Helena. I believe that Big Sky High School students were the main force in these protests although I’m sure Hellgate High School students were supportive and in attendance. Actually, the organizing work for each of the schools was done by students from those schools. And to my knowledge all of the Big Sky students were in Helena at the time the Hellgate students marched.